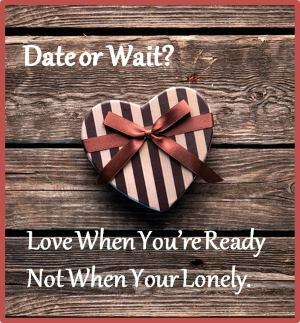 Post Divorce Dating: Are You Really Ready to Date Again? Post divorce dating is scary enough, but if you start dating too soon, you set yourself up for disappointment and heartache. If you're trying to figure out if it's the right time, here are some tips to help you decide if you're ready for the dating scene. By Antonia Ragozzino, author of "Taking Out the Trash"
If you are anxiously awaiting the opportunity to date after your divorce, think about the dynamics of spending time with someone else during this really uncomfortable time in your life. This past summer, I was primping for a date with a really nice guy and looking forward to an amazing dinner. It was such a treat as I had been so ready to meet new people, enjoy great food and great conversation. As soon as he picked me up, I felt tension in the car. I couldn't put my finger on it but it was slightly awkward. I had known this gentleman for a short period of time through a friend at work. We were not complete strangers, so I was wondering what the tension was that I could slice with a knife. We sat to dinner and continued idle chit chat. He was very pleasant, but hardly cracked a smile and seemed preoccupied. As we started discussing the menu, the talk of the ex-wife surfaced. Anywhere from "My wife hated sushi, that's why I could never do sushi!" to "I never really went out on Saturday nights, my wife and I enjoyed dinner at home and a movie." So there were several things going on here. He was still holding on to his past and a social Saturday night. Also, he was not comfortable being out on a Saturday night as it was not his scene. As dinner went on, he huffed, puffed, yawned, looked around the room, and seemed to be very negative. I don't think it was me at all, I just think he wasn't comfortable with himself or the social dating scene yet. I was as cordial as I could be but I ended up counseling him all night long on his emotional baggage and how to throw it out. The ride home, directly after the bill was paid, consisted of me telling him he is going to have a rough couple of months and to hang in there and stay strong. As I was getting out of the car, he hugged me, thanked me and said "you are really cool, take care." Um…ok, that clearly meant he was not in any way planning on seeing me again, which was completely ok. I walked to my house mentally exhausted. I wanted a light Saturday night with good food and conversation and maybe a spark. At least I got a great dinner for my counseling services. So think about yourself now. Do you feel like the poor defeated divorced gentlemen that tried so hard to go out on a date with me? If you are unable to let go of the past or at least tuck it aside for a few hours on a date, you should not be out. If you are unable to carry on a conversation without filing complaints, introducing comparisons or stories regarding your ex or inviting your ex into every facet of the conversation, you should not be out. If you are unable to let your hair and your guard down and really get to know the person sitting across the table from you without being distracted or seeming disinterested, you should not be out. If 1, 2 or 3 describes you at the moment, I wouldn't want to date you, would you? When is the right time for post divorce dating? So think about it and do not rush. Do not blast through all of the time it takes to really be comfortable in the company of yourself and truly decide what you want moving forward in a partner. Most times we are desperate to jump in and fill the emptiness that we just do not take the time to breathe, clear out the negativity and regain a fresh positive perspective on what we want. Know that your feelings are normal and ok. Everyone goes through the exact same thing. But do not feel you have to hurry up and date to fill the void you feel right now. The void needs to be filled with happiness, acceptance and love for yourself. As soon as this is fulfilled anyone would be happy and lucky to date you! Now go and enjoy yourself, you deserve it! It's ok to go on a friendly date and be social, but realize that's all it is. Be ok with it, have a few laughs and enjoy. But if you think you are ready for heavy dating, you probably will have those horrible negative times with some really great people. Not every date or person has to be the right fit either so keep in mind that though you may not have a spark or attraction, you may be on the verge of making a great new friend. Every date is an opportunity to harvest something good from. Extract what you can whether it is romance, a new friend or just a nice evening out. For now, enjoy yourself. Get your strength back and get the relationship back with you! Learn who you are after this divorce. Get to know this person and learn how to be comfortable with this person. Whoever this new you is anyone would be dying to go on a date with. Nobody wants to masquerade as the "Divorce Whisperer" on their first date. Your date should not be forced to act as the Mother Teresa or the Pope either. There is a difference between stating a fact that is relevant to a conversation and constant complaining and whining. You should look forward to the date and consider it a pleasant opportunity of adventure and not treat it as an ex-bashing party where your date unfortunately becomes collateral damage. Antonia Ragozzino, Author of "Taking Out the Trash"